There is no question that breeding the next World Champion, World Dairy Expo Holstein Champion or even a Royal Winter Fair Grand Champion is the dream of almost every breeder who has ever entered the show ring. The challenge is that achieving such a feat takes a combination of many factors. First you have to have the genetics to win. Then you need to have the will to win. And of course, then everything must come together on show day if you are to achieve that dream. In looking at the first part of this equation, there is no doubt that breeding is part science and part art form. But at least from the science part, we thought we would take a deeper look. So we went looking for two key things, first those sires that excel in those traits that are in demand in the show ring, and secondly those sires that have the ability to produce the extremes, not just the averages. 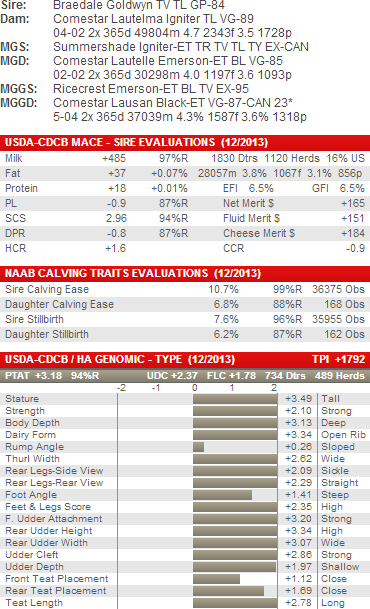 You see we are not wanting those sires that will give you five out of five VG-85-2YR olds. 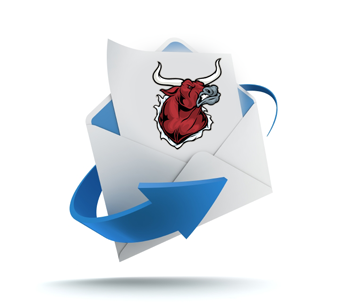 We are wanting those sires that stand the best chance of giving you that 89 point2YR old that turns into your 97 point mature cow, which can then contend for all the big show awards. 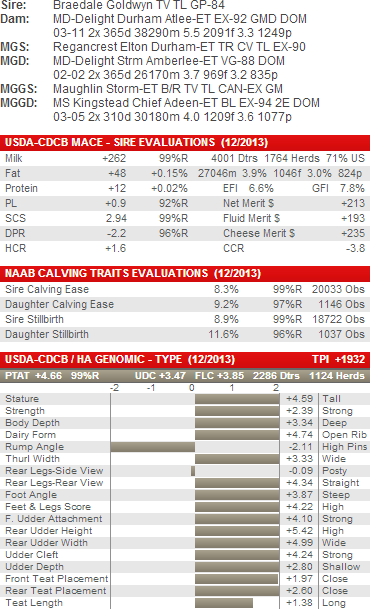 The easiest way to find outliers is to compare two sires for their daughters’ performance. 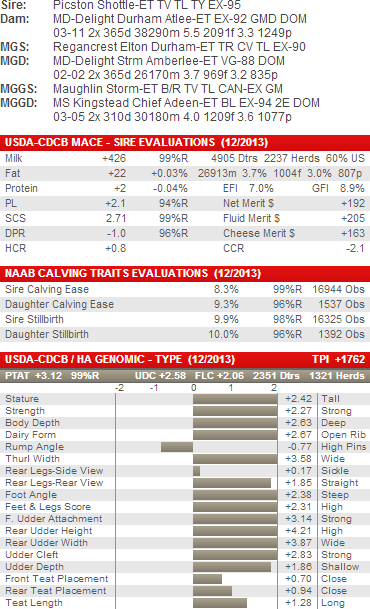 Then identify those sires that have the greatest deviation from their average daughter. This is not to be confused with Type scores in the US that are expressed in Standard Deviations. The best way to describe this is by an example. Let’s say we have two bulls each with 10 daughters. The following table shows their level of improvement for type across the 10 Daughters. Both of these sires would have an average improvement of 12 points. Hypothetically if this was the whole population of their daughters they both would get the same conformation score. The problem is they are two very different sires and the numbers tell us that. However these are not the numbers that most breeders get to see. First let’s be clear about what we are talking about. We are talking about breeding the next generation of World Champions. There is no question that Goldwyn is dominating this generation, but who will be the next sire to achieve such greatness. So it’s only natural that at least a couple of Goldwyn’s make the list. Lauthority, a Goldwyn from the great Laurie Sheik family, may not be as much an extreme sire higher up on our list, as he is more of a mister consistent sire, but his tall dairy daughters are just too special to not have on our list. His daughters can tend to be a little flatter in the loin than would be desired, but his extreme mammary systems, combined with wide rumps will certainly catch the eye of many judges. The 2nd Goldwyn sire on our list is HEAVENLY GOLDEN DREAMS. This full brother to Atwood had a very impressive showing at the recent Italian National Show (Read more: Cremona Italy National Holstein Show Results). Golden Dreams actually has higher genomic tests for all the major conformation traits than Atwood, especially in rumps, an area that if I was going to fault Atwood on it would be thus area. Golden Dreams daughters may not be as deep as Atwood’s. It’s no surprise that the first genomic test sire on our list comes from one of the hottest genomic families in the world the Rudy Missy’s. Maximus is an Atwood son from PINE-TREE SHOTTLE MINNIE, who is a sister to the popular type sire, Pine-Tree Sid. It’s no surprise that when you put the cow family that produced Sid, combined with Atwood/Goldwyn bloodlines that the potential for greatness is there. You can expect Maximus daughters to be tall, walk uphill and have extreme angularity, though you will need to protect him in the pin setting. However, with a genomic conformation test that is 6 points higher than his parent average he certainly got the best these two great cow families had to offer (+20 vs +14). For those of you who are not afraid of genomics, but rather see it as a way to get ahead, there is Snowy. 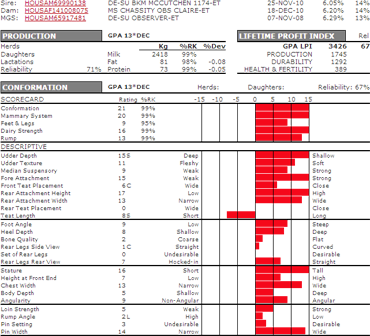 No surprise this genomic giant came from the De-Su, considering that De-Su seems to be the only breeder that is able to keep pace with the large genetic corporations. 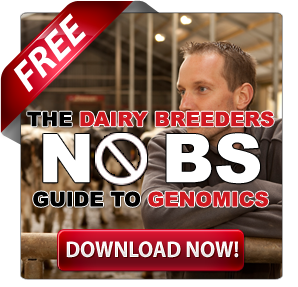 (Read more: Dairy Breeders vs. Genetic Corporations: Who are the True Master Breeders?) In Snowy you have some legends when it comes to producing sons. Through Let it Snow (his sire) you have Broeks MBM Elsa EX 1* NLD and LYLEHAVEN LILA Z EX-94 18*, both Golden Dam Finalists. (Read more: BROEKS MBM ELSA – 2012 Golden Dam Finalist and LYLEHAVEN LILA Z – 2012 Golden Dam Finalist). Through his maternal side you have another Golden Dam finalist MD-DELIGHT DURHAM ATLEE EX-92 GMD DOM 6* (Read more: MD DELIGHT DURHAM ATLEE – 2012 Golden Dam Finalist) and DE-SU 7051 EX DOM. It’s no wonder that Snowy is tied for the highest DGV Conformation test at +24. Expect his daughters to be tall and dairy with great feet and legs. While his rumps may not be great for calving ease, they should be fine for the show ring. In an era when it seems that genomic sires come and go quickly or, more accurately, are constantly being surpassed by the new hot sire, Brokaw has been able to stand strong. In Brokaw you combine the two greatest type families in the breed today. On the paternal side you have Atwood and his dam MD-DELIGHT DURHAM ATLEE EX-92-4YR-USA DOM GMD 2*, 2012 Golden Dam finalist and Reserve Intermediate Champion at Madison in 2005 followed by her grand dam MS Kingstead Chief Adeen EX-94. On the maternal side you have REGANCREST MAC BIKASA VG-87-2YR-USA who is the daughter of REGANCREST-PR BARBIE EX-92-7YR-USA DOM GMD 3*, also a 2012 Golden Dam Finalist. Watch for Brokaw to be extremely tall and have the necessary frame, dairyness and bolted on udders to get the job done. While his rumps may not be ideal for classification, expect them to be bang on when it comes to the show ring, demonstrating the necessary width and boxcar rumps that judges love so much. A third sire with a DGV for conformation +24 is CLAYNOOK DILIGENT. This early Velthuis Let It Snow is from the WINDSOR-MANOR RUD ZIP EX-95-4E-USA DOM GMD 1* cow family. Similar to High Octane, Diligent’s pedigree may not read as a who’s who of the show ring, with sires like Snowman and a double dose of Planet, but if you have confidence in the genomic system, this sire is sure to deliver. The nice part about Diligent is that there is no Goldwyn in his pedigree. Therefore he can be an outcross sire to use on your Goldwyn daughters. In fact Diligent is a nice conformation cross on the typical Goldwyn as he excels in both pin width and body depth without sacrificing the mammary system. While AFTERSHOCK daughters are not as silky or refined as many Goldwyn’s, he does make a great proven cross on your Goldwyn’s. As proven by his Goldwyn brother, Atwood, there really is no question that the cross can deliver at the highest levels. 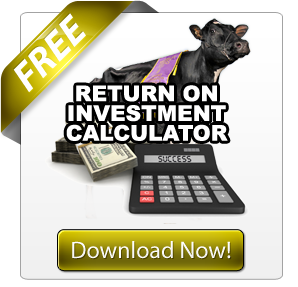 While you won’t typically get that all black heifer that the show ring loves, you will get extreme loin strength, feet and legs and dairy strength. That is just what many Goldwyn’s require to take them to the next level. 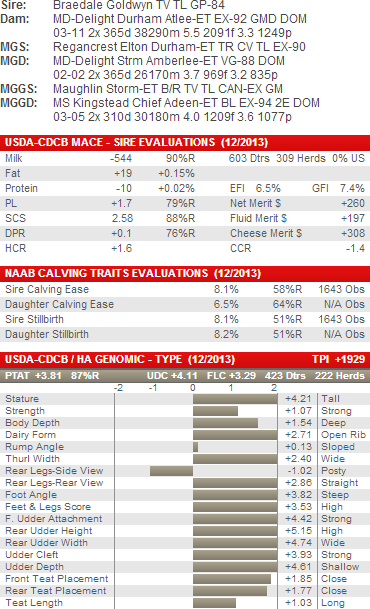 The last of our genomic test sires and the greatest outlier in the breed for type is LADYS-MANOR SAVIOR. This Lauthority son (#10 on our list), has insane genomic tests. 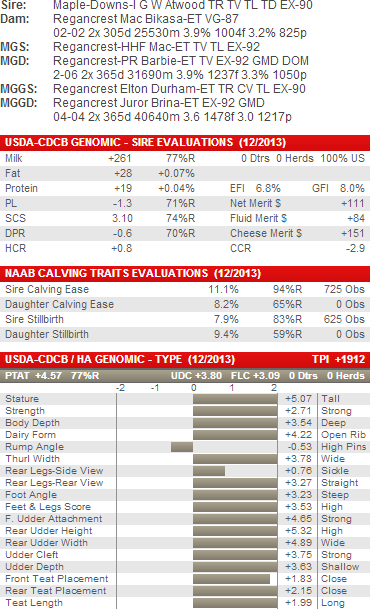 His genomic test for conformation +24 is tied for tops in the breed and is 10 points higher than his parent average (+14). From the same cow family as that produced Shamrock, Savior’s third dam is LADYS-MANOR RUBY JEN EX-94-2E-USA DOM GMD. When looking to produce an extreme outlier, you need to mate them to exactly such an extreme outlier as this. SAVIOR is that extreme outlier. His linear is perfect for the show ring, and he will certainly leave a range in his daughters, as he is also a list topper when it comes to daughter deviation. Call it playing it safe, or call it the smart choice, either way you look at it, Atwood and his extensive use and consistent transmitting ability will certainly leave the most daughters that will contend with those of his sire Goldwyn. There are so many reasons to choose Atwood. First you have the magic Goldwyn on Durham cross, then you add in his dam who was the exceptional MD-DELIGHT DURHAM ATLEE EX-92-4YR-USA DOM GMD 2*. Atlee also had extreme conformation herself, winning Reserve Intermediate Champion at Madison in 2005, and going on to be named unanimous ALL-AMERICAN SR.3-YR that year. She comes by it naturally with her grand dam being MS Kingstead Chief Adeen EX-94. Combine that with the greatest type sire of the past half-decade, Goldwyn, and you have yourself an unbeatable show-winning package. Atwood offers the great mammary systems his pedigree would indicate but needs to be protected for flat loins and high pins, much like his sire. While he may not pass his sire in accomplishments, there is no question that Atwood is establishing himself as the heir apparent. 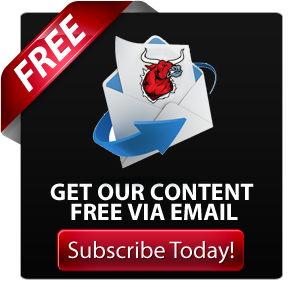 While playing it safe will certainly give you the most consistent type herd from top to bottom, sometimes you need to search for those outliers that can throw you the extremes. 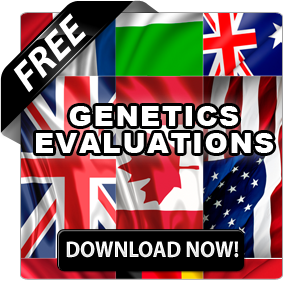 In this list we give you a mixture of proven sires, genomic sires, and sires that are going to leave you some extreme ranges. 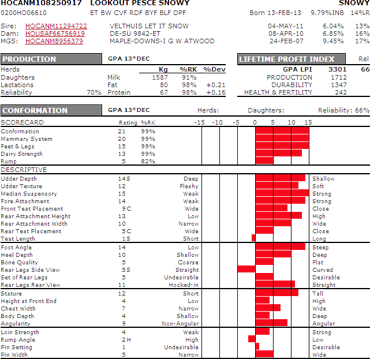 While you certainly must always consider corrective mating when breeding for the show ring, it’s also important to try some sires that will give you the extremes.